If order inflows are a harbinger of an improvement in the investment cycle, India Inc has reason to feel happy. 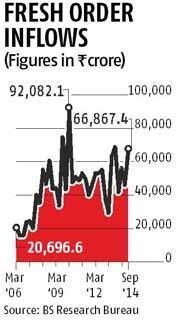 In the quarter ended September this year, companies received about Rs 67,000 crore (Rs 670 billion) worth of fresh orders, up 45 per cent on a quarter-on-quarter basis and the highest in the past four quarters (see chart). The momentum has continued into the quarter ending December, too, with companies reporting fresh orders of about Rs 20,000 crore (Rs 200 billion) so far this quarter. 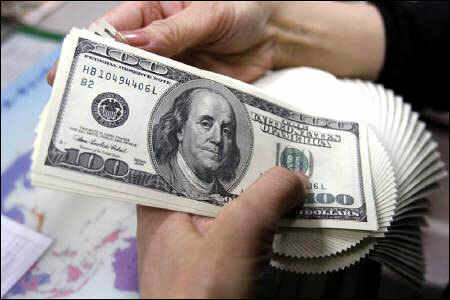 In the December quarter of FY13, companies had received Rs 41,654 crore (Rs 416.54 billion) worth of new orders. Capital goods companies accounted for about 85 per cent of the overall order inflow in October, followed by construction and infrastructure firms (12 per cent). The rest is accounted for by information technology services companies and offshore service providers, data compiled by Business Standard Research Bureau show. The order inflow in the July-September quarter was, however, lower compared to the year-ago period, though the pace of decline moderated sharply compared to fall in the previous quarter, hinting at a recovery in the coming quarters. During the second quarter, the inflow of fresh orders declined 2.6 per cent on a year-on-year basis, against the 27 per cent annual decline in the June quarter. Optimism is also visible in new projects data released by the Department of Industrial Policy and Promotion. In the April-August period this year, a total of Rs 2.6 lakh crore (Rs 2.6 trillion) of new investment proposals have been cleared by the department, against Rs 2.48 lakh crore (Rs 2.48 trillion) during the corresponding period last year (see table). Analysts are, however, keeping their fingers crossed, saying the uptick could be due to select projects getting off the ground, rather than a secular rise in capital expenditure. "We need to see data for at least the next two quarters before arriving at a firm conclusion,” says Kunal Sheth, capital goods analysts at Prabhudas Leeladhar. Others on the Street are more bullish. “There are clear signs of movement on stalled projects and recovery in the corporate capex cycle. Leading capital goods and engineering companies such as Bharat Heavy Electricals Ltd (Bhel) and Larsen & Toubro (L&T) are now reporting new orders, indicating a recovery in the investment cycle,” says Devang Mehta, senior vice-president and head (equity sales), Anand Rathi Financial Services. Overall, orders for equipment for 9,000-Mw power projects have been placed or finalised so far this financial year, according to estimates by Antique Stock Broking. Cumulatively, companies had won Rs 1.32 lakh crore (Rs 1.32 trillion) worth of fresh orders across sectors during the first seven months of this financial year. In the past month, Bhel has bagged fresh orders amounting to Rs 12,081 crore (Rs 120.81 billion). Of these, engineering, procurement and construction orders amount to Rs 7,800 crore (Rs 78 billion), while L&T has bagged orders worth Rs 8,072 crore (Rs 80.72 billion). IL&FS Engineering and Construction Company received two contracts amounting to Rs 1,412 crore (Rs 14.12 billion). Analysts suggest the capital goods sector will be a significant beneficiary of a revival in the domestic capex cycle. Emerging segments such as green energy corridors, intra-state transmission projects and substation automation will drive growth, they add. Within the capital goods sector, they expect L&T to gain from dedicated freight corridors. According to reports, Dedicated Freight Corridor Corporation of India plans to award orders worth about $7.5 billion in FY15-FY16 -- $4 billion in civil construction and $3.5 billion in electrical/signalling. Narendra Modi, a lucky mascot for the Indian economy?